This cereal was described in a 1984 commercial as "a feast of raisins, dates and apples... all from Sun-Maid... it's the taste you've been looking for... discover Kellogg's Fruitful Bran... discover just how good a fiber cereal can taste." 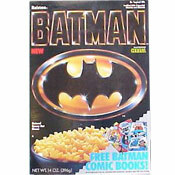 In 1983, the cereal also included peaches. In 1990, the Center for Science in the Public Interest measured the amount of fruit in Fruitful Bran and found that a 14-ounce box contained less than 1.4 ounces of fruit. The scene alternates between a librarian-type woman, a male truck driver and fruit falling into a barrel. Woman: I don't want some wimpy tasting cereal. Jingle: If you want bushels of taste... Fruitful Bran! Man: I don't want some itty-bitty taste. Jingle: Peaches, rasins, apples, dates... Fruitful Bran! Woman: Did you say peaches? Jingle: Bushels of flavor swimming in the flakes... Fruitful Bran has bushels of taste. 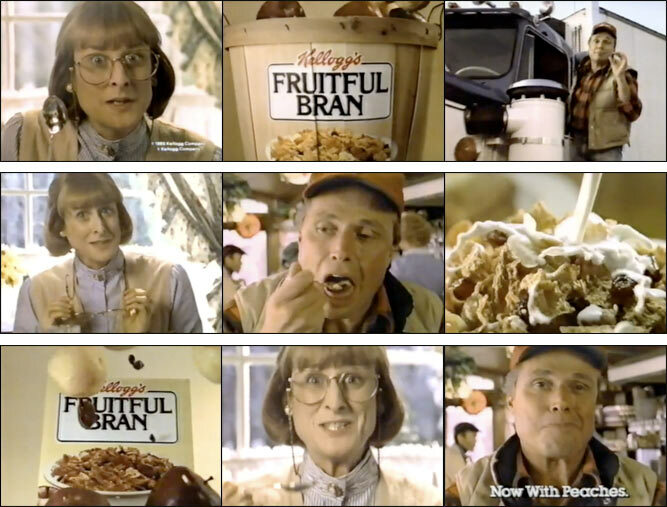 Jingle: Bushels and bushels and bushels of taste in Kellogg's Fruitful Bran. A man and a woman examine cereals in a grocery store aisle. Man: There's nothing different here. Woman: I'd say something's very different here. A fantastic light beams down from above. Their surrounding turn into to a type of heaven. They join a group drawn to a giant box of Fruitful Bran. Narrator: That something is Kellogg's Fruitful Bran. The scene becomes a majestic feast. Narrator: Fruitful Bran is a feast of raisins, dates and apples... all from Sun-Maid... it's the taste you've been looking for... discover Kellogg's Fruitful Bran... discover just how good a fiber cereal can taste." The man and woman each sample spoonfuls of the cereal. They smile at one another. What do you think of Fruitful Bran? View all 14 comments for this cereal. TRY THE FRUITY COOKIE RECIPE WITH RAISIN BRAN! Combine raisin bran cereal, flour, baking soda and salt. Set aside. In a large bowl, butter and sugars until creamy. Add egg and almond flavoring, Continue beating until smooth. Gradually add cereal mixture, mixing until well blended. 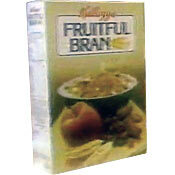 I absolutely loved Fruitful Bran cereal. I not only ate it for breakfast but ate it for other meals and a great night time snack!! I really wish Kellogg's would put it back in the grocery stores. Loved it... made delicious cookies with it too... trying to find that recipe. Best cereal ever. I even ate it for lunch and dinner occasionally. Please bring it back! I loved it and also loved the recipe for cookies using the cereal... I can't find it... anyone have it? Fruitful Bran was one of the BEST cereals Kellogg's has ever made! Why is it not available now?! Bring it back! Please bring back Fruitful Bran! With people wanting to eat healthier, this would be a great way to start the day! Miss it! Also speaking for my daughter who grew up with it. Please bring it back! Kellogg's, are you listening?? Bring it back. This is Kellogg's equal to the Classic Coke fiasco.